The Gauteng government held a memorial service on Thursday for those who died in the collapse of TB Joshua’s Lagos church. Again we heard they died serving the Lord. While this may offer some comfort to relatives, those responsible are yet to be brought to justice and eleven families are still waiting for their loved ones' remains. By ANDREA TEAGLE & GREG NICOLSON. 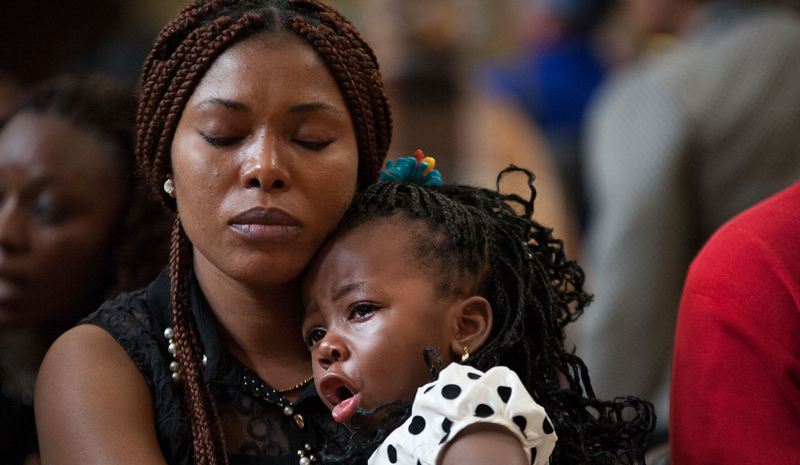 The Tshibasu family, originally from Democratic Republic of Congo, was among the many mourners who gathered on Thursday at the Johannesburg Town Hall to honour the to 22 Gauteng victims of the fatal collapse of the Synagogue Church of All Nations building in September. Premier David Makhura addressed the event along with a host of religious leaders. Makhura echoed the sentiments of shared grief and tragedy that Deputy President Cyril Ramaphosa expressed at the reception for 74 of the repatriated bodies on Sunday. “If you test the strength of a family, if you test the strength of a nation, it is in times of grief,” said the premier. He was at pains to emphasise the role of the government in bringing the deceased home, and how leadership of South Africa “is also affected”. “You do have a government who cares. The government of Jacob Zuma has been doing everything… every day, every hour to try to bring them home,” said Makhura. He thanked the families for co-operating with government during the more than two months it took to bring the bodies back. After his speech, Makhura spoke to the media on the sidelines of the memorial about the national unity brought about by the tragedy. “This grief, national collective grief, has shown that when we work together we do very, very well… I think this shows the best in South Africa,” Makhura stated. The various family members – sons, daughters, uncles, aunts, parents, grandparents – some in suits, some in colourful dresses, doeks and hats, sat down. Two months of waiting and wondering has left a well of grief too deep for tears. However, as the Joyous Celebration Choir began to sing, some rose, swaying and clapping their hands. While the memorial service was taking place, TB Joshua was due to appear at the coroner’s inquest into the disaster in Lagos. He once again failed to show. While the coroner threatened to order his arrest, Joshua’s lawyers told reporters at the hearing they were challenging the jurisdiction of the coroner to issue a witness summons. Meanwhile, it emerged on Wednesday that the aircraft seen above the church builing before its collapse was a military plane belonging to the Nigerian Air Force. According to police investigator, Superintendent Olusola Agoi, the plane was on a circuit-training mission at the time of the collapse. Before Thursday’s ceremony was over, Gauteng safety MEC Faith Mazibuko listed the funerals taking place around the province this week. Some have already buried their loved ones while Mazibuko said the last funeral planned in the province is for Sunday. But for 11 families, the grieving process is far from over. There were 85 South Africans who died in the tragedy, but the government has only been able to bring 74 home. The remaining 11 are yet to be properly identified. Long journey home: 74 Nigerian church collapse returned for burial – but will there be justice? in Daily Maverick.